Stonefield Castle, part of the Bespoke Hotels collection and situated on the tranquil shores of Loch Fyne, has undergone substantial investment in recent months, with bedrooms refurbished to an extremely high standard, alongside the drawing room, library, lounge and restaurant. Harris Tweed now abounds, fittingly enough, while prints from local artist Stuart Herd decorate both bedrooms and corridors. A selection of vintage parlour games, including an antique snooker table, also graces the games room. There’s even a fully operational telescope in the library, which will come in handy for any visiting astronomers wishing to sample some of Britain’s most unpolluted starry skies. Refurbishments have been completed at an opportune time for the property, which was named Scottish Hotel Restaurant of the Year in 2015, as well as one of the top ten castle hotels by the Daily Telegraph earlier this month. It’s not hard to see why, given that both the hotel and restaurant boast spectacular views overlooking the Mull of Kintyre, while being surrounded on all sides by 60 acres of pristine woodland, including one of the largest rhododendron gardens in the UK, as well as wildlife including otters, seals, and even humpback whales in the neighbouring waters. 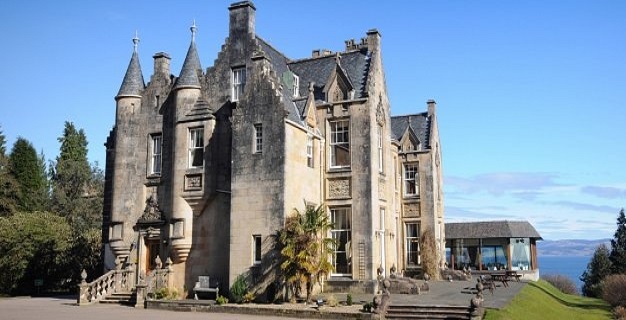 Built in 1837, Stonefield Castle is an outstanding example of Scottish baronial architecture, retaining many of its original furnishings, such as wood paneling, ornate ceilings and marble fireplaces, whilst also providing all the digital mod-cons a tech savvy guest could wish for, as well as the all-important bedside coffee machines! For those who’ve built up an appetite after a day exploring the grounds, and perhaps even being gifted a private tour by the hotel’s octogenarian gardener, who was recently honoured by the Royal Horticultural Society, the Stonefield Restaurant offers outstanding food in a truly memorably setting.